Zack Greinke to miss two months, Carlos Quentin needs a reality check: I’m not saying Carlos Quentin should be suspended two months (as suggested by an obviously upset Don Mattingly), but I will say the kangaroo court that should have been held after his charging of the mound against the Dodgers last week should have been stern. 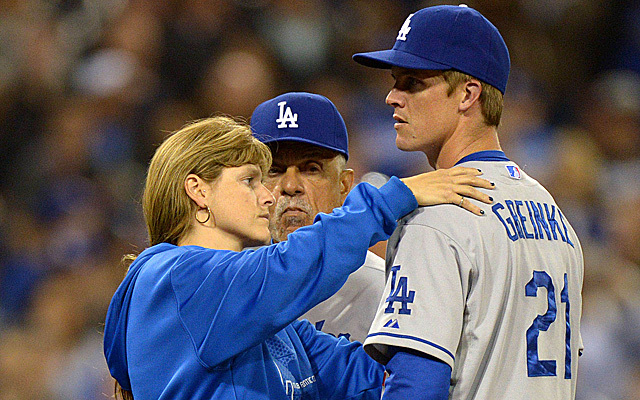 Listen, it was a 2-1 game, a full count, and Greinke needs that inside corner. If you as a batter aren’t willing to give it to him (or anyone else for that matter) then you realize you are probably going to take a few. No one was throwing at your head, no one did it intentionally, and the reason Greinke probably reacted differently was because no grown man wants to get stared down. Period. The fact that Quentin has led the league in hit by pitches the last two years, and has been plunked 116 times in his career was irrelevant in the moment. Now the Dodgers, with sky-high expectations, are to go on without their $147 million dollar co-ace because of a broken collarbone suffered in an avoidable fracas. Senseless. Angels, Blue jays, and Reds are in big trouble: Before the start of the season I wasn’t drinking the kool-aid on the Blue Jays and Reds, I was susceptible to the Angels, but only barely as I stated they were paper thin with their rotation. Well in the past week, Jered Weaver, Johnny Cueto, and Jose Reyes all suffered injuries that will keep them out a significant amount of time. Reyes, whose legs are his greatest asset, will be sidelined until at least July with an ankle injury. Weaver, who dislocated his non-throwing forearm, is down for a month. Cueto’s timetable for return is questionable because lat strains can’t accurately be determined, as recoveries vary from person-to-person. All three play on teams who have high playoff expectations and losing records to start the season. I would venture to say that all three could be in serious trouble before memorial day. In the case of the Angels it could be worse because the staff after C.J. Wilson is full of pitchers I wouldn’t classify as anything better than a three and they are coming off a loss to the Twins. What is Dusty Baker doing in Cincinnati? : I know the job of manager can be a lonely one. Curt Schilling recently put it best when he said the job of a manager isn’t to know how to hit a 98-mph fastball, but to manage the egos and characters on the ball club and put them in the best position to win. So what has happened to Dusty Baker? Last week against the Phillies leaving Bronson Arroyo in to face left-handed pinch hitter Chase Utley (with Aroldis Chapman fresh in the bullpen) was questionable, and the countless blunders he made during the Reds five-game losing streak showed something is slightly off with his decision making. He may want to figure that out soon, the Reds expect too much for this team to be buried by its manager. Ubaldo Jimenez makes it hard to believe he was supposed to be next big thing: Remember when Ubaldo Jimenez was 15-1 at the All-Star break? That was 2010 when he finished 19-8 (4-7 down the stretch) and had us all convinced he was the next great pitcher in baseball. Well, three years, a trade, and a 17 loss season later we are wondering how can you allow this guy to go on? He lasted just 1.2 innings and gave up all seven runs to the Red Sox yesterday. His velocity just isn’t what it used to be and he hasn’t made an adjustment to that fact. At this point, I question whether he can. The Houston Astros are tied for last place in the American League West at 4-10. Think about that for a moment. Meanwhile, the Colorado Rockies are 10-4 and leading the National League West. I can’t decide which is more surprising. Sticking with the Rockies for a moment, Todd Helton (.538 BA, 1 HR, 6 rbi last seven days) and Carlos Gonzalez (.529 BA, 1 HR, 9 hits, 5 XBH last seven days) are two players who are as hot as it gets. Since his three home run game on April 7th, Will Middlebrooks has hit .091 with zero extra base hits, 8 strikeouts, and an on-base percentage of .125. Meanwhile, I guy I pleaded you stop making the “who’s better” comparisons with, Manny Machado, has hit .320 with a home run, 3 rbi and an on-base percentage of .346. I told you to take it easy. The Cubs, ummm….pitched(?) a major league record five wild pitches in an inning on April 14th. Besides finding new ways to blow should be wins, that tells you everything you need to know about how this season is going to go for them. How screwy are things in Miami? The Marlins are 29th to 31st in all major offensive categories, but are top-10 in quality starts (9th). And how bad do I feel for Giancarlo Stanton? Even though he’s currently on the disabled list (shoulder) he doesn’t have a home run or an RBI. For future arbitration cases with him, I think he should argue the ineptness of the front-office is costing him production (and dollars). Next Post Why ‘Scrubs’ Is One Of The Greatest Sitcoms. Ever.